Well, some of you may be wondering whether I’ve dropped off the face of the earth. No, I’m still here. I’ve been busy doing all sorts of things including travelling. I’ve recently come back from a two-week trip to England and Ireland. This isn’t a travel blog so if you’d like to read about all I’ve been up to with my American travel companions, Bob and Sheryl then pop over to Bob’s website. I visited London. I didn’t have a lot of time so I tried to make the best use of what I could do with the time available. On Wednesday morning despite feeling lousy with a cold I opened the curtains, my mood lifted ten-fold. Brilliant blue sky and radiant sunshine! After having breakfast in the Sheraton Skyline restaurant and armed with brochures, train and bus information I walked down the road to catch the 253 red double-decker bus to Hatton Cross station. The bus circled the perimeter of the airport so I got to see a tonne of enormous planes. At the station I brought a return ticket for 11 pounds. I had to wait less than 5 minutes before the train turned up. I checked to make sure I was on the right train and before long I was on the tube riding on the Piccadilly line. It was a good time to ride the train as it was quiet. Three-quarters of an hour later and thinking I was never going to get there I arrived at Green Park. I got off the train, took the first exit and ended up in what I presume was Green Park. I got my bearings and despite the Big Bus hop on and hop off being there I discovered I was less than seven minutes from Buckingham Palace so I decided to walk. The sun was brilliantly hot and Green Park was just gorgeous and green. The trees were heavy with blossom, there were daffodils everywhere and lots of pretty flowers. It was just gorgeous. I arrived at Buckingham Palace. Staring through the gates I could see a guard standing ramrod straight. The mail was being delivered in the Royal Mail van. A sign on the grounds indicated that there would be no changing of the guard today. The Palace was big, but looked friendlier than what I had imagined. I was confused about what was going on outside the Palace. I assumed that one could actually drive on the road around the Palace, but today it was all blocked off and there were barricades everywhere. There was a huge police presence – in cars, vans, on foot, motorcycle, bicycle and horse. I walked around the statue in the middle and dipped my hand in the water. I walked down the mall and was impressed with all the huge country flags lining the streets. It was then that I saw the sign – Commonwealth meeting. A ha! That explained the heavy police presence. Every now and again an official car would come down the road flanked by numerous police vehicles. Maybe it was New Zealand’s Prime Minister Jacinda Ardern off to meet the Queen. The barricades I quickly worked out were for Sunday’s London Marathon. I didn’t make it to the end of the mall. I began to realise that time would be working against me all day and I felt pressure to get on and do stuff. I diverted into St James Park and marvelled again at the pretty flower and the deck chairs which you could hire. 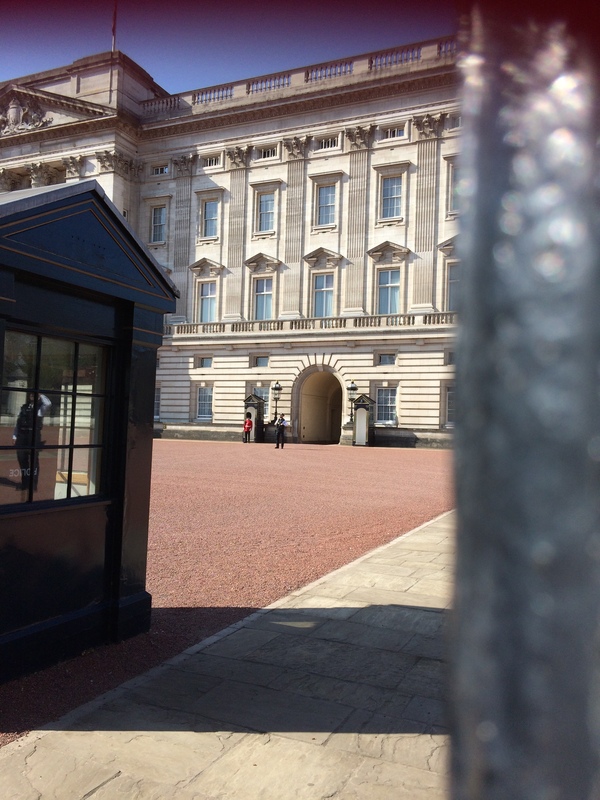 I made my way around the side of Buckingham Palace. I diligently followed my map to where I thought I could catch the bus, but nothing was making sense. I stopped to ask a rickshaw guy who turned my map around the right way where we had a giggle and I was off on my way again (what was that about women who can’t read maps?!). I found where I needed to get the Big Bus. Outside the Royal Mews. While I waited for the bus I was finally able to stand back and soak up the hustle and bustle of London. It seemed every few minutes one of those cute black cabs would roll pass. I love them! And I chuckled as across the road was the Palace Fish and Chips. I can’t imagine the Queen stepping out for fish and chips. The bus finally arrived and I went up the top snagging the last seat. 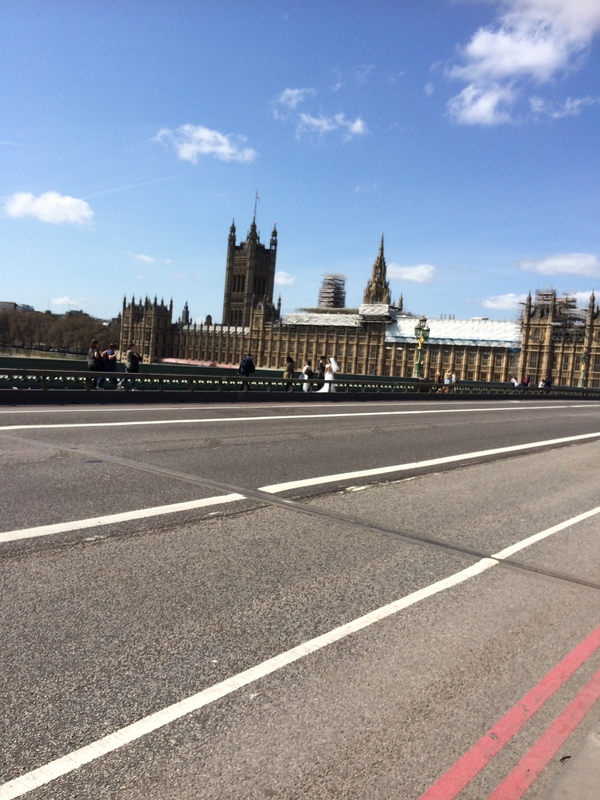 We made our way slowly through the traffic around the Palace to Westminster Abbey. Wow! Amazing and so many famous people buried there. Going inside the Abbey was definitely on my list of things to do so made a note to get off on the next trip around on the bus. And the bus got caught up in the second protest of my trip. took photos of Indians waving flags and banners and yelling about something, but I’m not sure what they were protesting about. Over the Westminster Bridge and my first look at the Thames. Wow! She’s big and very busy. And dirty. But I’ve since found out it’s the mud being churned up from the bottom that makes it dirty. The Thames is one of the cleanest rivers in the world and home to 120 different species of fish. It seemed like this would be a good place to get off and do the river cruise. 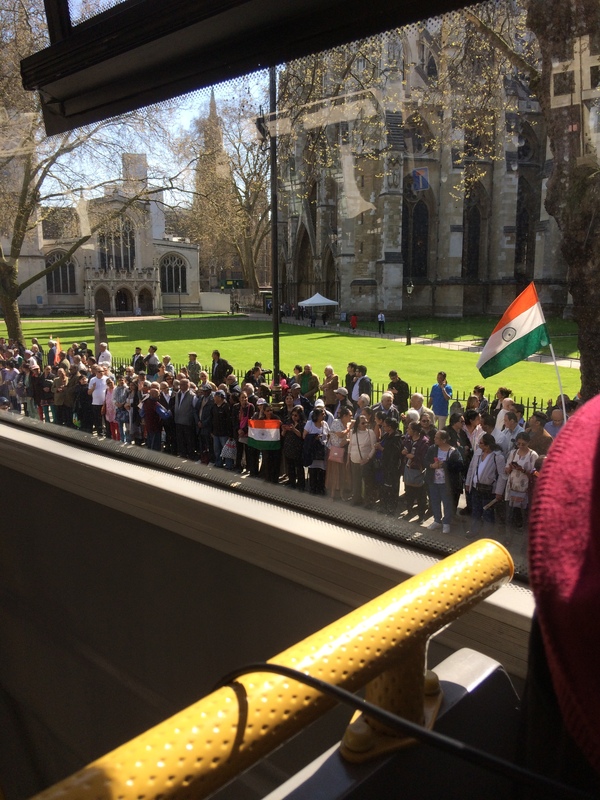 I walked back over the bridge crowded with people, rickshaw drivers and a man dressed in zany union jack attire handing out English pub food flyers. When I got on the ferry I was able to get a seat outside on top, which was great. It was such a brilliant day weather wise. In fact, it was starting to get down-right hot! Apparently the weather in London had not been great in the previous week and today was the first day they had people out on the top deck. There was live commentary all the way and I learnt lots about London. Once the ferry got underway we made our way over to have a look at the Eye. I’m embarrassed to say it was nothing like what I had envisaged, which was like a ferris wheel that goes around quickly and you would be sitting outside. The little cabs were moving so slowly it was hard to even work out if they were moving at all. It would’ve been a great day to do the Eye because the skies were so clear. We then continued on down the Thames. I loved the architecture – the old and the new, the Shard and some other buildings I’ve forgotten the names of. 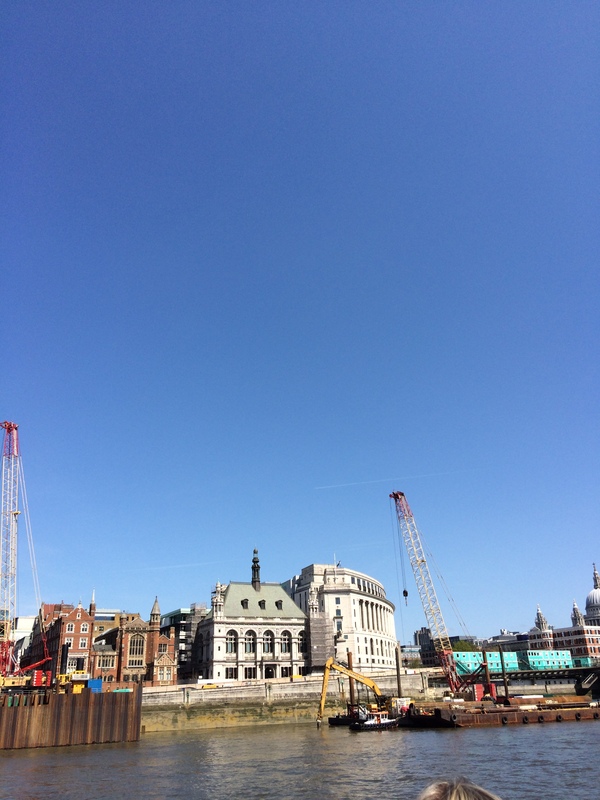 There is a tonne of construction going on and some very large buildings being built. We went under London Bridge and had a good look at London Tower. The ferry stopped at Tower Quay and the commentator mentioned that you could get off here or go on to Greenwich. I decided to stay on the ferry. The landscape changed as we continued up the Thames. I got off at Greenwich and was immediately charmed by the quaint seaside town. I saw the Cutty Sark and decided to go on it on the way back. As I ventured up the first street I could feel a happiness about the town – the tourists, the locals and how laid back it was. The third shop I came to was a book shop! Yay! It was called Cafe W so I went upstairs to have lunch and a nice cold lemonade. They had a great selection of journals and notebooks and creative writing journals and I wanted to buy them all. In the end I was very restrained and didn’t buy anything! One of the things I loved about Ireland and England was the great array of independent bookshops they have, which is really lacking in the US, NZ and Australia. From the bookshop I stumbled across the Greenwich markets, which was a really cool place to hang out and look at the arts and crafts. One Chinese food stall had a guy making something from long noodles I think it was that he kept whirling and twirling in the air. From there I had a quick look around the old naval buildings. Wow! These buildings were amazing – so much history and once again the architecture blew me away. I really wanted to do some of the tours. However, it was getting close to 3 pm by this time, which was when the next ferry left. 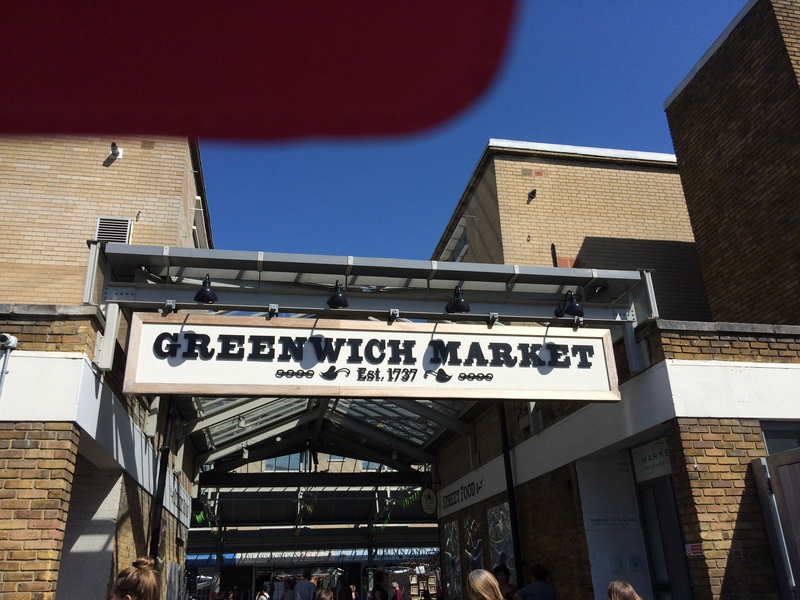 I left Greenwich feeling as though I’d just touched the surface. I didn’t have time to really look around or do the Cutty Sark. Back on the ferry, back down the Thames and an hour later I was back in London. My intention was to get back on the Big Bus, but I was getting pretty knackered by then and knew I would need to get back to Green Park to get the tube back to Hatton Cross. So with a heavy heart I got off the ferry and made my way somehow to St James Park and walked along the Birdcage. 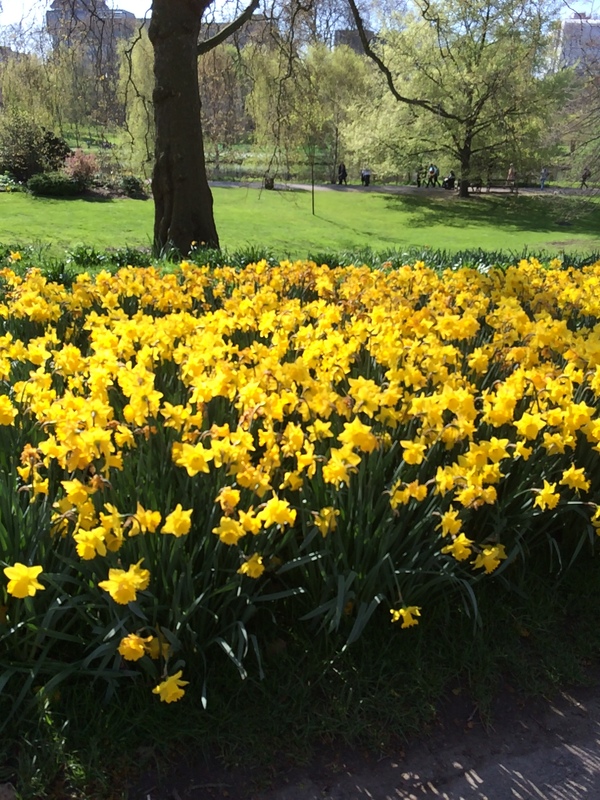 St James Park was also so pretty in all its spring glory. There was an ice cream stand in the park and I would dearly have loved to have an ice cream, but I needed to keep moving. I walked across the Blue Bridge, alongside Buckingham Palace, back through Green Park on the tube. What a contrast to the quiet ride in that morning! Standing room only, hot, stifling, smelly and this is where you no longer worried about invading someone else’s space. By 5.30 pm I was back at Hatton Cross and by 6.00 pm back at the hotel. When I was cleaning my face that night I couldn’t help notice how much dirt I had wiped off my face and on closer inspection I had a little red nose and red forehead. Yes, I had got sunburnt while sitting out on the ferry! I thoroughly enjoyed my day in London despite only doing three stops of the Big Bus and virtually running all day to see everything. I had to admit I was sceptical about London. It had never been a place that I really wanted to visit but, I loved it! It was vibrant, alive, quirky, bustling, with a character all of its own (and I just love those dinky little black cabs). The history is rich and I loved the buildings. Ha Ha! I told you you’d love London! Just wish our colds weren’t so bad that we had to come home early and leave you on your own. I would have so loved to show you all my favorite places. But, you found the best one on your own, St. James Park. Can’t tell you how many hours I spent there, watching the world go by when I lived in London. I’ll just have to give you a rain check on the guided tour! Of course you were right! You’re on with the the rain check and I love your guided tours. Copyright Casey Fae Hewson 2016. Unauthorized use and/or duplication of this material without express and written permission from this site’s author and owner is strictly prohibited. Excerpts and links may be used, provided that full and clear credit is given to the author and Casey Fae Hewson with appropriate and specific direction to the original content.